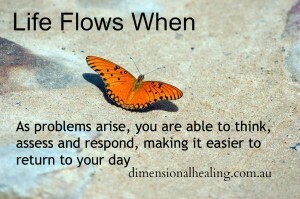 Feeling balanced is a sense of confidence in how your life is flowing. It’s a feeling that comes from within you. It doesn’t rely on what others think of you, or what you do for them. It’s knowing who you are, the essence of you, what you want in life and what steps to take to get there without the need to tread on anyone else. Feeling Balanced – Life Flows! Balance occurs when work and all aspects of your life mix in a way that is comfortable for you. Your life feels smooth. You feel confident in your ability to tackle change or develop new skills. As challenges arise you work through solutions. We get so busy with work, family and home we often complicate our lives unnecessarily relying on external influences to validate our feelings of success and satisfaction in life. Feeling balanced is attained when we reclaim our sense of self identity. We learn to tap into our internal wisdom and use our intuition to guide our choices. Are you struggling with self doubt, feeling left out or unappreciated? Just Contact Me! So Tell Me – What does feeling balanced mean for you? What is your sign that you need to return to your core being and make changes? Please leave a comment and share…. Are You ready to start your 5 day Confidence Challenge Today? What are your business chakras? Hmmm. A work-life balance is enough for me. Thanks Delia, we all need challenge, it’s what drives us, but we need to keep it in perspective as well. I’ve learned that life will never flow easily, and that there will always be twists and turns. Some will be expected, and others will come out of no where. It’s just the journey of life. But there are plenty of ways to make the journey easier and to feel balanced. Love the tips Lorelle! Thank Keri, we all know there’ll be twists but its how we deal with them that shows how balanced we really are. A challenging question indeed! Finding balance is one of those daring things we have to face daily. I have found that the sense of balance turns into inner peace & strength to say “no” and don’t feel guilty about it. It helps by rearranging priorities everyday, not heeding into those urgent demands that pop out. Great check list to review and keep handy. Thanks Suzie, my place is to walk the earth/grass barefoot and sit with the trees. I would be balanced, if I didn’t get woken up by the kid and the dog during the night, and my husband didn’t act the way he does. Hi Linda, no matter how well we are doing, past stuff can get caught in the space between ourself and someone else. The energy work I do can work on that, making things smoother. Sometimes I find hard on my self to feel balanced on my life. I guess because we struggle with many situations, that sometimes I just worry to mucho. One thing that can trigger my emotions is lack of sleep, when I’m stress out. Consequently, I don’t feel balanced. Takes time to correct those things you need to change in our lives. Stress affects us on so many levels Remy, it can sit in your energy and pop up when you least expect it. ©. Copyright Lorelle McIntyre Dimensional Healing 2012 - 2019 All rights reserved.